Authentic Mongolian Yurts and Wooden Cabins provide a fitting child-friendly retreat for those of you looking for a real haven from the hustle and bustle of modern-day life. There is also a camping field for happy Campers. Both bedrooms have the provision of modern-day wardrobes, enabling guests to pack away their clothes with ease and care. So should you find yourselves packing some of your best attire or simply casual style tops and bottoms, have reassurance that your clothes can be stored away in style. Set within a tranquil valley in the heart of West Devon, each Yurt stands tall on a wooden deck, nestled into the hillside in its own private area, with generous space to explore, adventure and unwind. 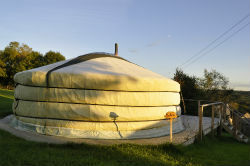 A Yurt is a traditional Mongolian tent consisting of wooden lattice walls, an insulating felt layer and a heavy waterproof canvas over the top. 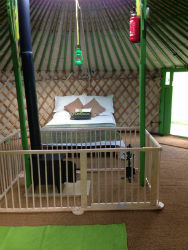 Our Yurts have been hand crafted in Mongolia by traditional Mongolian Yurt builders and each one is bespoke. 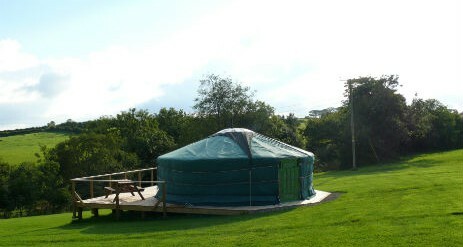 The Yurt will accommodate a maximum of six people and are equipped with a comfy double bed, a double day bed and 2 single futons. Coir matting and rugs have been provided to keep your tootsies warm, along with a central log burner, enabling you to feel warm and cosy at all times. 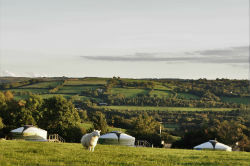 Immediately outside each Yurt, a private decking area is available accommodating a picnic bench and BBQ facility, enabling guests to eat al fresco and soak in the stunning surrounding views, perfect for hazy, warm evenings with only the stars and surrounding natural habitat to share the evenings with you. 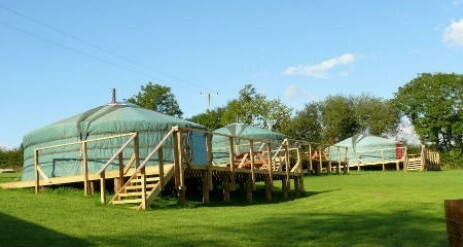 Due to encouraging an eco-friendly approach, Oak Tree-Lane Yurts do not have any electricity; they are fitted with solar powered light and lanterns, which only adds to their charm. 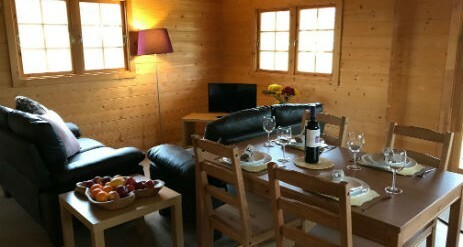 Each Yurt has a private and fully equipped Field Kitchen which compromises all necessary kitchen utensils, a picnic bench, gas cooker and fridge-freezer. Guests also have the provision of their own private sanitary facilities comprising a power shower, basin and wc. 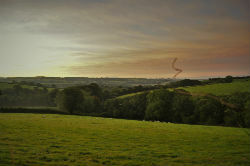 Oak Tree-Lane is a family run farm with livestock of pigs and sheep. It also accommodates a fine selection of poultry including turkeys, geese and hens, all of which can wonder freely in their designated fields. Of course, we must not forget the farm cat, Snowy! 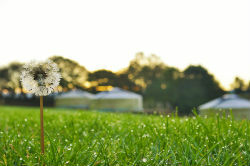 Young budding farmers are able to enjoy much of the farm during their stay and help feed the animals. 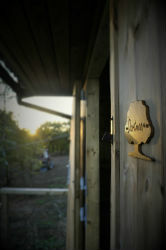 Oak Tree-Lane proudly offers the sale of its own eggs, lovingly laid daily by our happy hens. 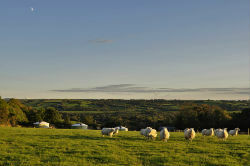 We also offer the sale of a fine selection of home-grown meats of pork and lamb, so whether you fancy a sausage sandwich, an egg and bacon banjo or even a treat of a joint of meat to roast, guests can be reassured that it doesn’t come any more home grown than this as all meat sold has been lovingly grown on site! £10 per night for a two-person tent. 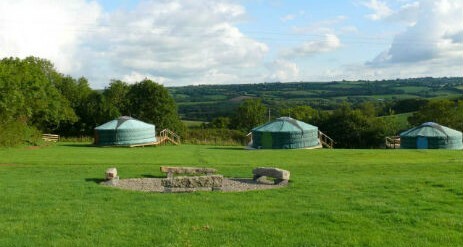 £20 per night for all other tents including Bell Tents and Tipis. 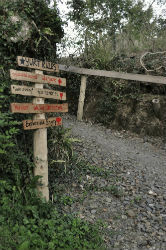 Oak Tree Lane is located just off the A30 between Launceston and Okehampton on the Devon/Cornwall border. 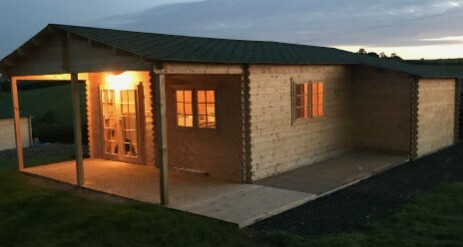 Surrounded by the lush green Devonshire countryside, it is conveniently situated a mile from Roadford Lake Country Park. With over 730 acres of water, Roadford Lake has something genuine to offer all those that visit and is the largest lake for watersports in the South West. At the lake you can enjoy a range of activities both on and off the water including sailing, windsurfing, kayaking, high ropes, climbing and archery. 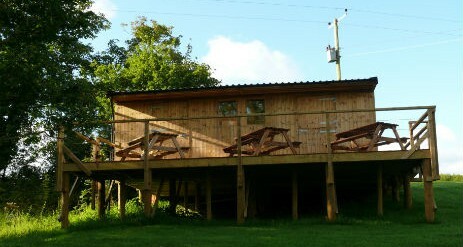 Or simply just relax with a delicious cream tea and enjoy the view. 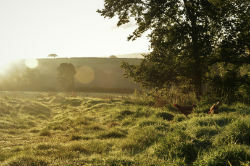 Oak Tree-Lane is ideally located since it is an hours’ drive for both the North and South Devon coastlines. 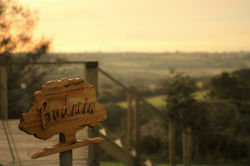 Cornwall is only a twenty minute drive away with the Eden Project being a pleasant hours’ journey across Bodmin Moor. And to compliment all this, National Trust properties are in an abundance here; ideal for guests whom enjoy this activity. All in all, should you choose to holiday at Oak Tree-Lane, we are confident that you will not be disappointed in your stay here. 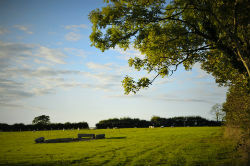 We also have the provision of a Camping area, designed to accommodate in excess of 30 large Camping pitches. Sorry we do not allow pets, with the exception of guide dogs. Please note that the ground is undulating and naturally sloped in areas.